Arts | I met Steve Abbott at the outdoor antique market in Sacramento. He was with a group of other photographers and he had a Speed Graphic over his shoulder. I was with my mother and I had a rangefinder around my neck. We came around the corner face to face and … Whoa! Vintage camera freakout. Abbott, 47, has been working with film exclusively for the last couple of years. His latest project is a series of portraits shot using a 4x5 Graflex RB and sometimes the aforementioned Speed Graphic. Some of them are regular film and some are tintype, a very early photographic process in which the image lives on a polished metal plate. There is a depth and richness to the large-format images that is very hard to get from 35mm film. Abbott is one of a growing number of photographers who have come from the digital world and are turning to film for its emotional quality. The movement is a recognition that digital can’t yet do what old-fashioned film can. It is, in small part, nostalgia for a form of craftsmanship that was almost killed by the digital revolution. Steve Abbott in a serendipitous double exposure in front of Travis Mortz’ darkroom. There is also recognition that digital gear has a shelf life. High-end film cameras have always been good and will always be good. They essentially never become obsolete. We had the chance to sit down with Abbott and talk photography and cameras. Where did you start out on this journey? Abbott: I first picked up a camera in 8th grade. I did the darkroom elective for art and that kind of gave me that initial smell of fixer and developer. Years later I got into music and that was my creative outlet. I played in bands for 10 years. Then we moved out here and when my kid was born we were given a little digital camera and that was kind of the start of it. I figured I had left the East Coast and left the band and there was a creative void. I took to it pretty quickly, photographing my son. Not just doing snapshots but trying to be creative with it. That quickly led me to different cameras. I also branched out into wildlife and bird photography. Birding has been a thread throughout my life. Through some of my portrait work with my son, friends of friends of friends would ask me to shoot a wedding, that type of thing. With much trepidation I went into that and had a great experience and started to do weddings and family portraiture, things like that. I started to get into fashion photography and model work as a great way to kind of work on things. Getting comfortable with pulling people out of themselves. There came a point where I was doing an ad campaign for a jewelry company in Santa Barbara and I was doing some airbrushing of hair across this model’s face and it hit me like a load of bricks that I am taking away reality. I am touching up so much that it’s no longer real. The real part really meant a lot to me when it came to photography. So I stopped doing a lot of touchup work. Around this time I had started dating a woman whose father owned a photography business in the Bay Area that had been around since the 1900s. One day at a barbecue at his camp up in the foothills, he hands me this cardboard box and says, “I think you might have some fun with this.” I opened it up and there was a Hasselblad 500CM in there. It was a working camera from his business. It struck me that here was this camera that was as old as I was and it still worked like a clock. Whereas with these digital cameras you get five or six years out of them and they are really starting to break down and you have to upgrade, right? Of course there is the whole Steve Jobsian thing of you don’t know what you need until I tell you you need it kind of marketing that is really prevalent. So I started shooting film. The first few times were pretty disastrous. I learned on digital so these computers were doing all the calculations for me. I was starting to learn there is a lot more to it than one or two wheels. So a Hasselblad was your first film camera? Abbott: Essentially, yeah. Shortly after that I found a Nikon FE with a 50 on it at a pawn shop and I picked it up for $20. It was more familiar to me, more like a digital camera. Over the next couple years he gifted me a couple other cameras, a Speed Graphic and he gave me that 8x10 field camera that I have. In his mind they were just taking up space in his place. He knew I would appreciate it. I sure as hell do. 2016, I kind of did half and half. I got to the end of the year and I looked at my stuff. I looked back on my year of shooting and everything I loved was shot on film. So I sold all my digital bodies and bought a Leica M6 and I was 100% film and I haven’t looked back. I feel like in the last two years I have learned immeasurably more about photography and light than I had in the previous 13, 14 years. Over the last couple years I have moved into large format. Both 4x5 and 8x10. And then there’s tintype. So the stuff we have in this article you shot with the SpeedGraphic? Abbott: The Graflex RB series D 4x5. Which is basically a big SLR from before the war, both of them. Abbott. Yes. I have a couple of them now. My main one, the 4x5, is from 1943, but they started building those about 1903, the old Auto Graflex. That particular design proved worthy and they kept it going for 40 years. Some of the best photographers ever used them. Edward Weston used one. Abbott: Dorothea Lange. The thing I love about that camera is it gives me that large negative, that gives that depth you just can’t get from the smaller formats. I can do it hand-held. … With the Graflex I can see that focus point on the ground glass and trip the shutter while looking at it. It is a lot more nimble, a lot more accurate. What kind of shutter does it have? A Compur and a focal plane? Abbott: It doesn’t have a Compur shutter it has a focal plane shutter. Abbott: It’s a 191 millimeter but it’s in inches. 8 1/2 inches or 7 1/2 inches, something like that; f4.5. It’s a Bausch and Lomb lens that came standard on it. I love shooting 4x5. I am finding the larger the negative the more invested you become. Not only monetarily but like the stakes have become higher, right? Now I don’t have an SD card where I have 4,000 shots and I can just keep shooting until I get something right. Now it’s like “All right, let’s take a look at the scene.” A big part of it for me is the engagement you get when you’re using a camera like that. Does that make sense? When you are doing that you are going back to the roots of the thing. Going back to the alchemy as an aspect of it. It is less complicated but in other ways it’s more complicated because it’s chemistry … these elemental things. It’s not digital stuff. The thing about digital is you actually don’t really have anything. You pretty much got nothin’. If the neutron bomb goes off, you got nothin’. You only really have anything if you have print in your hand. Abbott: That’s another thing. I have a shoebox with hard drives in it that I haven’t looked at since I shot them. So are they going to end up dying there? They call it the digital dark ages. I have a shoebox of prints from my childhood that I can pick up and look through. Even at that, though, you are using digital because you are developing your film, but you are digitizing the film to make prints. I am not being judgmental. Abbott: (Laughing) You are, you are. Absolutely, but I still have that negative sitting there. What are you working on now? What’s the thing that’s making you fired up to go shoot photos? Abbott: Portraits; using that camera. There is a depth to shooting on 4x5 and getting close to a person and shooting a portrait. It reaches into that person and kind of reveals things that aren’t necessarily on the surface. I know that sounds hokey. It is the gradual fall-off of focus you get with a larger film plane. It gives you more context but you still have that separation of your subject. It’s special and it’s what makes looking at historic photos magic, to me. Again, these are all opinions. These are my opinions that drive what I am wanting to do. They are my beliefs. Talk a little about this group of photos we are showing. Is this all a part of your current body of work? Abbott: So that folder is essentially everything I have shot on that RB since I got it. Right now I want to build a body of work around the portrait. Not just a pretty picture but an honest photo of people. I have a project in mind where I take just two photos of somebody. One would be a close-up frame-filling face and then an environmental portrait, and then pair them. Model Dagney Hollmann materializes in silver on a tin plate. Sidebar | Jaques Louis Dagguerre invented the first photographic process in 1839 in France. 20 years later Adolphe-Alexandre Martin invented what became the tintype. Originally called a Melainotype or a Ferrotype it is a photograph printed on a black lacquered metal plate. The process makes an image that cannot be reproduced. The metal base of the image made them very popular in the 19th century because they were inexpensive and tough. They could be carried in the pocket relatively safely and many have survived over the years. The early wet form of the tintype used collodion, a binding liquid, with a solution of silver halide suspended in it. The emulsion makes a negative when exposed and developed. Being printed on a black surface the image appears as a positive image. 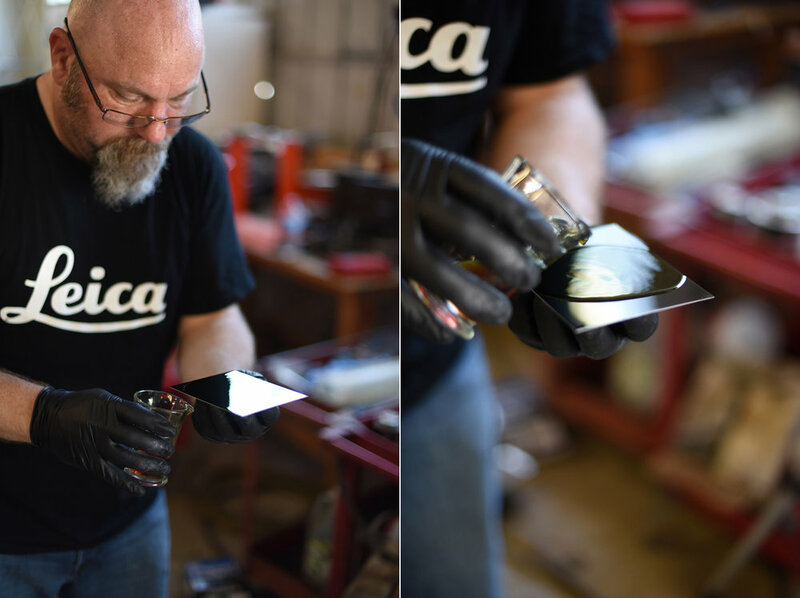 Abbott pours Collodion on the tin plate and rocks it gently to spread it evenly on the surface. The plates fit in a standard 4x5 film holder. The camera is a Speed Graphic. Long exposures are the rule. The process requires a handy dark room or dark box and a chemist’s lab full of chemicals. The last step of the process is a water bath that washes the fixer from the plate. The image appears as if by magic in the water bath. It is a time intensive process that requires a darkroom or dark box in which to handle the plate. In the 19 century photographers traveled with wagons done up with a dark room. Some photographers had dark boxes made up as packs they could cary on their backs. The collodion and the silver solution is poured on the plate which is loaded into the film holder in the dark. Exposures are much longer that modern film photography and the photographer must make test exposures to get it right. There are frequently no shutters on the original cameras. The lens cap is removed to expose the plate. As soon as the plate is exposed it must be developed. It is removed from the plate holder in the dark and developed. The process won’t work right if the plate dries out. It needs to be damp for the exposure to be even. The photographs have a silvery aura about them and a look that can’t be replicated by modern techniques. A growing number of photographers have taken up the collodion bottle to get that look. Old cameras are being dug out, old lenses searched out and cleaned up. There is an element of craftsmanship to this art form. An old world problem to be solved that makes the result all the more satisfying. There is a place for the old ways in the digital age. Anyone interested in learning the process can find clear instructions online.